Confession: On the topic of raisins, I am fairly uninterested. I don't dislike them, I just don't get excited about them. The idea of a raisin, at least, makes me feel like taking a nap. The reality is that I do quite like them, I just have this inexplicable, knee-jerk ambivalence whenever they come to mind. But because I have an out-of-control sweet tooth that leaves no stone unturned - thankfully or not? - I always wind up trying them in something anyway, and nine times out of ten, I love them. When I received this week's assignment for Rum & Raisin Muffins, I went through the usual aforementioned motions and emotions. I shrugged my shoulders and got to baking. What I was not expecting was to love these muffins. Inside and out. Unconditionally. Wholly. Truly. They are by far my favourites in the three weeks I've been participating in Muffin Monday. I am in mad, muffin love. And once again, these were so simple to make! I didn't actually have the brown rum this recipe called for, but considering we had a giant bottle of Amaretto on hand (purchased for the chilled soup testing a few weeks back), I thought I'd try using it instead. I also added a teaspoon of cinnamon to the wet batter, and then topped these heavenly buns with a cream cheese glaze (a nicer, more muffin-like word for frosting?). They were the most fragrant and moist muffins, with raisins that were juicy and bursting with the Amaretto they were soaked in. Alcohol and baked goods: a sinful yet genius marriage. 1. Leave the raisins to soak in the Amaretto 2-3 hours before baking. 2. Preheat the oven to 390°F . Prepare muffin tins by brushing the bases with oil. 3. Sift the flour and baking powder in a bowl. Mix in the sugar, then make a well in the middle. 4. In another bowl mix the egg, milk, butter, and cinnamon. Stir in the raisins with any Amaretto that is left from soaking them. 5. Add the liquid ingredients to the dry ones and fold lightly with a fork. Do not over-mix: It just has to be wet mostly through. 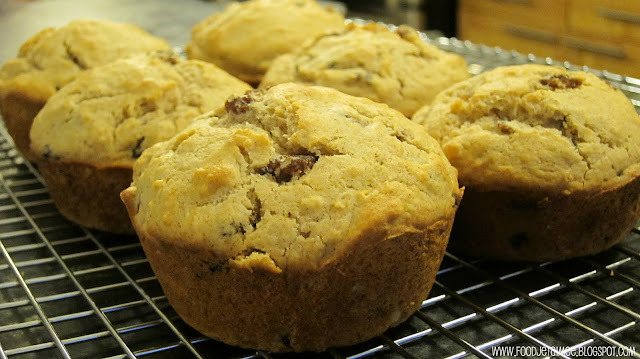 6.Spoon the batter into muffin tins, filling each one about two-thirds full. 7. Bake for approximately 15-20 minutes or until just starting to brown and a skewer or toothpick comes out clean. 8. Place muffins on a wire rack to cool. Combine all glaze ingredients in a medium bowl and beat with an electric mixer until smooth. Spread on room temperature muffins and serve. You can keep the glaze in the fridge until you're ready to serve them. A perfect treat for any time of day. Having (and photographing) an Amaretto and Raisin Muffin for breakfast. I bet these would be great with a smidgen of orange or lemon zest in the glaze, too. Next time? Stop by Baker Street to see what storm Anuradha is baking up this week, along with all the other Muffin Monday bakers and their versions of the Rum & Raisin Muffins! Great, now I'm drooling! You find a way to incorporate cream cheese...:) genious:)I absolutely LOVED these and they are also my favorite so far. My first instinct was to somehow work chocolate into them but was afraid to mess them up:) I must try the glaze though! Not enough amazing things to be said about this place of deliciousness!! I will be making these for sure. Your picture makes me want to take a huge bite out of that muffin and I love, love, love the little dish. Love what you did with the original recipe, too! I knew I loved the recipe because I wanted to make another batch again. That's a good indication, isn't it? YES on the DO NOT OVER MIX in bold. I cannot agree more. I loooove the glaze on your muffin! Looks really excelent! You made some great ones!! You should bottle that glaze and sell it! Yum!!! 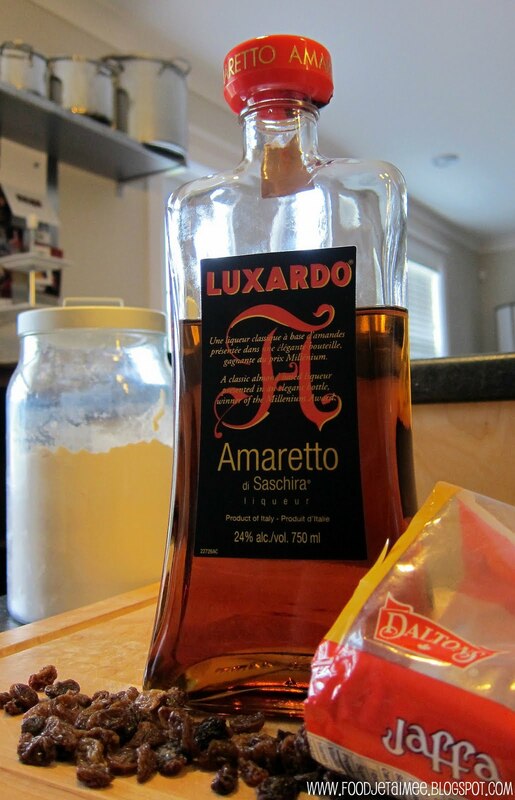 Amaretto is an absolute favorite! Love that you added the cream cheese on top. Has to be super delicious! Ahhh these muffins look perfect! I can only imagine the layers of flavor with the cinnamon and amaretto. Yum! Oh my, how delicious ! Your photos are so yummy, I have to restrain myself from jumping into the computer screen. Nice of you to join us again...it was fun baking alongside with you! The reason why I love you, and this blog, is that you have made me crave the most boring food accessory around - yep, raisins. What are we gonna make during my visit? I'm drooling already. yum! love that you frosted them. I too hate raisins, but i love that you used amaretto i'm going to try that next time! 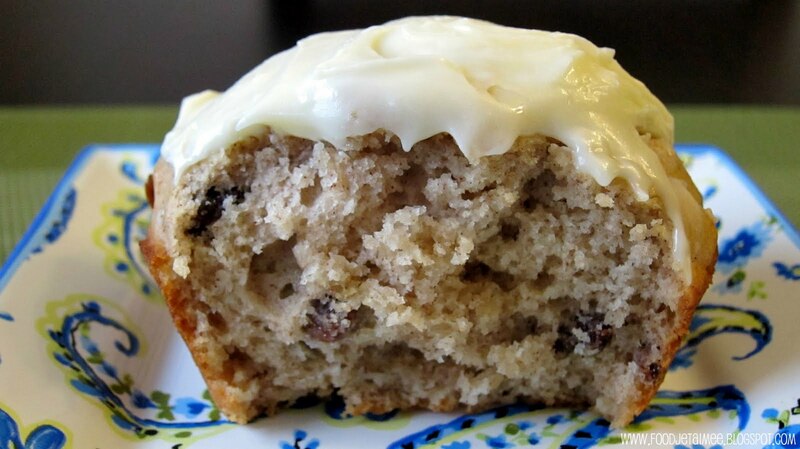 OMG the texture on this muffin is to die for. Just gorgeous!! Good call on the cream cheese glaze! And the amaretto appeals more to me than rum would. I love all the variations everyone has come up with - can't wait to see what you'll come up next week. Friends! Your comments made my day. Thank you! 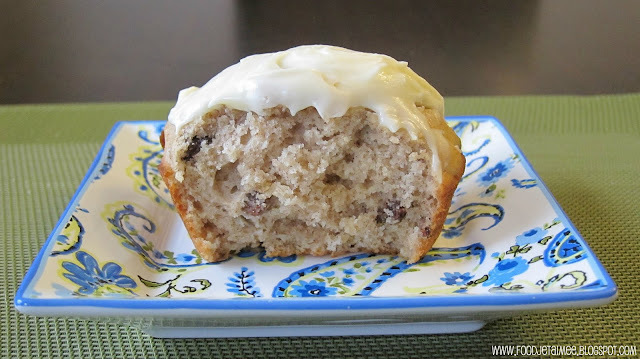 The cream cheese glaze went over extremely well among my muffin eaters this week. I used it on other desserts over the weekend, too, and added some lemon zest and fresh juice to it. Delicious! So funny that there are so many raisin haters out there. Soak them in alcohol for a few hours and you might change your mind, but if not, check out what the other bakers used as substitutes! Loved all the creativity this week!